MDPR Insider: Welcome to MDPR INSIDER! Through social media campaigns, event planning and other integrated marketing communications, the MDPR team works eagerly to provide clients the most creative and individualized public relations strategies. 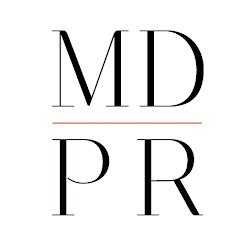 Please join us in debuting our new blog, MDPR Insider, where we aim to provide readers a glimpse inside the exhilarating world of public relations and give our clients, followers, friends, collaborators and supporters an outlet to view our work and share our inspirations for this exciting industry. Each day we will compose a blog post covering a different subject from a comprehensive list, encompassing everything from public relations and social media trends to the hottest fashions and tips for a healthy lifestyle. Discover useful tips to help jumpstart your week with our Monday posts about social media and public relations news as well as blogging and graphic design advice. We will also discuss some of our favorite photography and design apps that we use everyday to create aesthetically pleasing graphics and collages for our clients. Tuesday posts will cover topics dealing with health, fitness and nutrition. Each week, we will provide posts ranging from discussions on our favorite healthy recipes and tips to enhance your workouts and overall health to content on the best restaurants and places to workout in Chicago. We will also have information about farmer's markets and other wellness events in the area. Celebrate the middle of the week by starting to organize your weekend plans with our Wednesday posts about what's happening in the Chicago area. The posts will include the most anticipated events and other activities we love participating in when we are out of the office. We will also have a section on the complicated, yet crucial rules of social etiquette, so you can be sure to impress at your next social gathering. Learn how you can market your business with social media and public relations advice from our Thursday posts where we will offer suggestions on small changes you can make to increase brand awareness. We will also include informative articles written by other professionals who are knowledgeable about promoting businesses and organizations. Indulge yourself at the end of the week and get ready for a night out with some light reading on the most popular fashion and beauty trends. On Friday, we will talk about how to create a flawless look using some of our favorite products and beauty tips directly from the experts. We will also cover the hottest fashions from local boutiques and stores, brands and collections that we love, including an "outfit of the day" and our wish list. We have been anxiously anticipating the launch of MDPR Insider and hope that you have found the content fun, enlightening and informative. We thank you for visiting and are looking forward to your return for future posts.